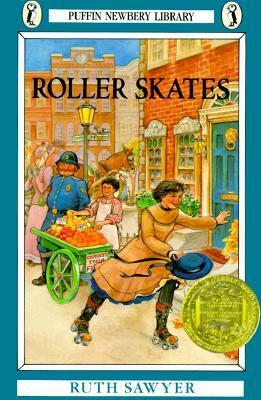 Roller Skates by Ruth Sawyer is a 1936 children's novel set in the 1890s. Lucinda Wyman is ten years old, and she is experiencing a year as an "orphan." While her parents travel in Italy, Lucinda stays in New York with the Peters sisters. Though Lucinda's very proper aunt, whom she must see from time to time, feels it is inappropriate for a young woman, Lucinda is frequently allowed to travel about the city on roller skates. While doing so, she meets a number of colorful characters who enrich this year of her life with warm friendships and opportunities to understand others' points of view. The remarkable thing about this book is the freedom Lucinda has to explore her environment. The book seems to have a very "free range" philosophy about raising children which is especially refreshing in this age of constant helicopter parenting. Indeed, in her Newbery acceptance speech for this book, the author herself said, "A free child is a happy child; and there is nothing more lovely; even a disagreeable child ceases to be disagreeable and is liked". Lucinda's freedom does occasionally lead to troubling circumstances, such as uncovering the body of a murder victim, and losing a young friend to serious illness, but even these seemingly mature events highlight Lucinda's empathy for her fellow New Yorkers and her resilience even in the face of tragedy. The book demonstrates how kids are capable of much more than adults typically give them credit for, and how a child given just one year of almost complete freedom can become a better person because of the experience. The writing is very accessible, and the descriptions of the streets, and of people like hansom cab drivers and fruit stand owners really place the reader in late 19th century New York. I constantly found myself with "The Sidewalks of New York" running through my head as I was reading. This book evokes the same feelings I have always associated with that song. While there are no major historical events at the heart of the story, the entire book is a study on a bygone era that tells kids what they really want to know about the past: what it was like to live day-to-day life and how it was different from today. Roller Skates is a wonderful book, but perhaps not the most appropriate for a sensitive reader. I would have reacted very poorly to the death scenes as a kid, and they would have upset me even more because so much of the rest of the book is so cheerful and even amusing. The book absolutely handles these scenes well, and I would not keep the book from my own children, but I do want to be sure to suggest it to them at a time when I think they are prepared to feel the sadness of those moments without being turned off to reading other sad stories in the future. I refused to read sad books for my entire childhood after Marta died of cholera in Meet Kirsten, and I definitely regret missing out on a lot of great stories. I think if that book had come into my life at a different time, I might have handled it better. I'll have to see how that theory pans out in the years to come.